Update: Only last night the Feathers was voted British Pub of the Year! Well done guys! After seeing the Feathers Inn (NE43 7SW) in the Good Food Guide 2011, and knowing they were hosting a British wines and ciders festival recently, we obviously had to tick it off the list. Perched atop the lovely little town of Hedley on the Hill, the pub is a gorgeous stone bricked old inn, a typical “locals” country pub. After an afternoon sampling more than a few delicious British ciders and wines, we managed to get one of the (only 14) tables on a fully booked night. As the menu changes on a daily basis, it’s a bit of a gamble what you can get, but you can be sure that everything is fresh and seasonal. Ever since trying the black pudding sausage roll at this years EAT festival, I had been craving some more. Lo and behold, tonight I was in luck! Words and photos cannot do this starter justice – black pudding is rich and meaty but not overly spicy, some of the best I’ve had. On it sits a gooey poached egg, but the star of the show is the gravy, which gives a spicy kick, wholesome and laced with soft onions. A stunning starter, we both commented we could easily have had more of this is as a main. Another favourite of ours is The Feathers homemade charcuterie board, toast and pickles (£7, pictured). Served on a wooden platter with (not enough!) toast, comes corn fed chicken liver parfait, Northumbria game pâté, meatloaf, coleslaw and some pickles. 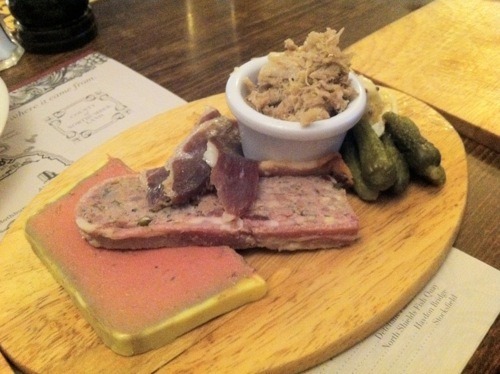 A real meat lovers plate, fantastic pâté, so smooth and creamy (presumably tons of butter!) and the most savoury flavours you could imagine. Interestingly, many of the meatloafs/pâtés (as well as whole cakes and sauces) are available to buy in kilo batches from the kitchen. Christmas gift for Newcastle Eats anyone? Service is friendly and knowledgeable, and a lovely touch is on the reverse of the menu where we see a map of the north-east showing all of the suppliers used and their relative distance from the pub. You can’t promote local sourcing much better that that! Drinks selection is also strong, with a thorough wine list, and all the local beers from Wylam et al. that you would expect to see. Beer battered North Sea haddock, chunky chips, tartar sauce and mushy peas (£11, pictured). 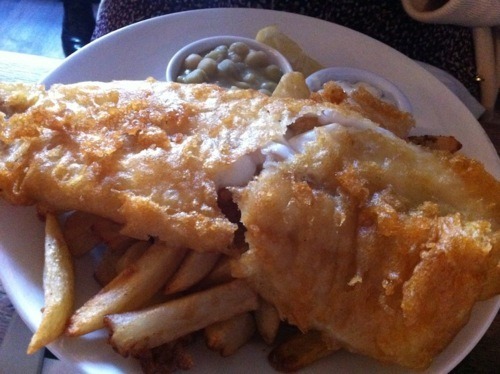 The latest in a series of Newcastle Eats fish & chips, and certainly one of the best. Super light and crispy beer batter encases masses of flaky white fish. 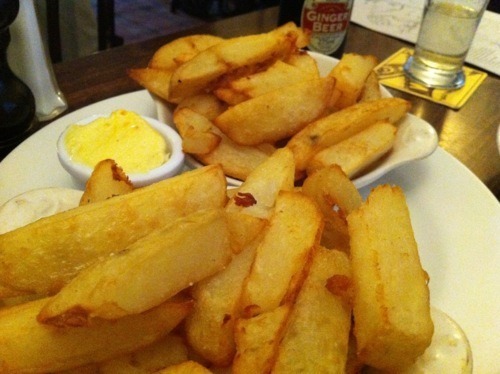 Chips here are quality; home made, chunky, and salty, the ideal chip, crispy out and fluffy inside. Classically served with Mushy peas and tartars sauce. On another visit we tried (for the first time!) wild rabbit in cider sauce with heritage potatoes and buttered kale (£13) which I can definitely recommend, even for someone who has never had rabbit. 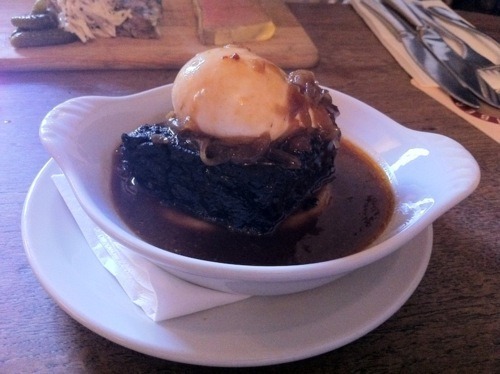 We also had the Graham Willie’s Chopwell Longhorn beef braised in red wine, creamy mash, glazed onions (£13), which is a huge hunk of meat! Again, both these dishes come with a superb sauces and hearty sides. 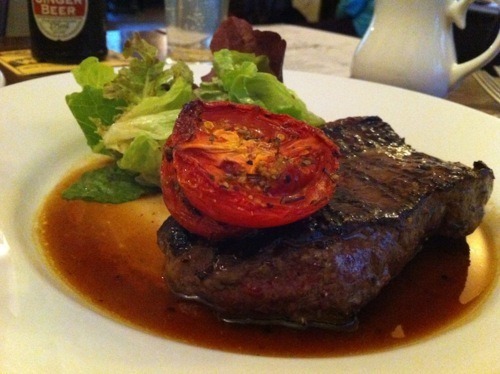 As stated on their website, The Feathers Inn “aims to bring the very finest cooking using local produce”. As evidenced by their latest win of “Best Gastropub in Yorkshire and North East” this year (for the fourth year in a row), a local, family run business that is all about good produce cooked simply but beautifully and all at good value – what are you waiting for? Our new favourite restaurant, and a must-visit. Visited on two occasions, July/August 2011 7PM. All information correct as of 09/09/2011.